Grace Hopper: Queen of Computer Code demonstrates to the reader persistence in problem solving. 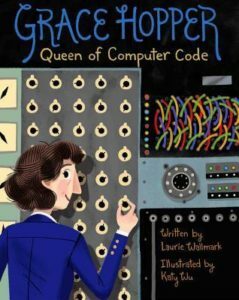 This biography explains Grace’s importance in the world of computer science, engineering, and math in a way that is easy to understand. Parts of the book also document stories about Grace’s childhood, her insatiable curiosity, and her love of learning. The illustrations are colorful and interesting. Some pages include inspirational quotations. This would be an excellent book to help introduce students to STEM processes.